This Interactive Fire Lab will be performed during Wealth Archetype Vishnu’s 11th Waxing Moon powertime. On this day the Moon will be in Mrigasira, a star of spiritual enlightenment and curiosity. 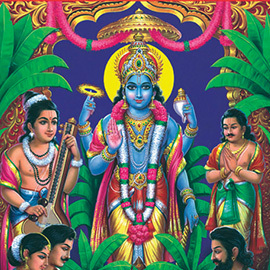 A respectful invocation of Vishnu on this day brings special blessings for on-going maintenance of abundance and comforts. This is a favorable time to renew targeted focus for increasing prosperity consciousness. We can ask to have enough money to take care of ourselves and have surplus to share with others. This fire prayer will help release blessings for safeguarding prosperity and for protection from unforeseen financial pitfalls. Join us on February 15th at 4:00 AM PST / 12:00 NOON UTC / 5:30 PM IST for a Live Interactive Fire Lab.